Kirsten Reynold's "Excerpt 8-D, 2 from the Probability Series" will be among works on display at the Mills Gallery. We mostly take for granted the spaces we live and work in, but as much as we make them our own, they put their stamp on us; they shape how we operate in the world. Curator Dina Deitsch deconstructs architecture's meanings in "(un)Building," a spotty group show at the Boston Center for the Arts Mills Gallery. Christopher Wawrinofsky's overblown piece has a ridiculously long title, beginning with "The Great Molasses Flood of 1919." In it, he attempts to conflate that bizarre Boston disaster with the Big Dig, "The Beverly Hillbillies," and the 1913 death of engine inventor Rudolf Diesel. It's ambitious but gassy, and looks more like a heap of trash than a meaningful sculpture. A simpler work, Emily Ambs's "Museum of Architectural Taste (MoAT)," featuring chocolates emblazoned with images of buildings by big-name architects, is sour pussed and one-note. Her idea, that architecture is developing a designer-label cachet, doesn't wash. Why shouldn't architects such as Frank Gehry and Zaha Hadid be pushing the boundaries of design? In contrast, performance artist Emily Katrencik gets right to the meat of the matter, literally breaking boundaries with video of her piece "Consuming 1.956 Inches Each Day for Forty-One Days," in which she gnaws through drywall, creating a hole. She follows up by baking some of the debris into bread. The video is brilliantly shot, intimate , and disturbing. Sculptors Samantha Fields and Sally Moore are both builders. Fields's engaging "Framed" gives us the skeleton of a dollhouse -- in a surprisingly ornate Victorian pattern, rather than the post-and-beam grid we expect. Moore offers several smart small structures that appear to be at once crumbling and pulling themselves precariously back together. 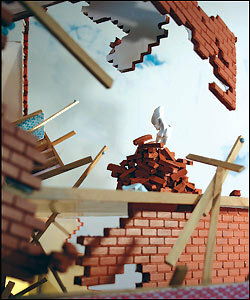 Kirsten Reynolds builds models, then photographs their demolition; here she offers images of the destruction of the Mills Gallery that are at once dizzying and oddly liberating. Joel Ross cuts into architecture to raise questions about history. For the beautiful but chilling "Sundown Town," he cut the letters of the phrase "every day at six" out of a barn wall in Illinois and mounted them in the field beside it, then photographed the result. Until 1968, African-Americans were banished from this all-white town after dark. It's hard to challenge a viewer's sense of space with photographs, video, and smallish sculptures. Ultimately, an exhibit about architecture would have done well to transform the gallery space. Wawrinofsky's piece is the only work attempting that here, dribbling from one room to the next. "(Un)Building" needs more of that, executed with more wit. Oscar Palacio's lyrical, haunting photographs, in a show in the Mills' project room, "History, Re-visited," consider how we construct history and offer it as solid and immutable in our monuments. Palacio goes to historic sites and photographs them in ways that reveal them as other than monumental. The mythic quality of the subject of "Plymouth Rock," for instance, shrivels when we see it through Palacio's eyes: It's just a rock behind a railing. Part carnival fun house, part biology lesson, brought to you by the high-tech wizardry of the Studio for Interrelated Media at Massachusetts College of Art, the spooky and delightful "Endosymbiont" installation at Axiom Gallery aims to transform the space into a cell. The show, curated by Dana Moser and featuring work by Jerel Dye , Jake Lee High , Sean O'Brien , and Fred Wolflink, won't please biology purists. It's not broken down into cellular anatomy, with ribosomes and mitochondria. "Endosymbiont" ( roughly, "within together") is more about energy exchange, and how responsive a cell is to what goes on around it. This one is super-sensitive. The four artists have lined the space with reflective Mylar curtains. The only lights come from projected animated video, which shimmers along the Mylar like moonlight on water. They have outfitted the gallery, which is in the MBTA Green Street Station, with sensors. A seismograph reads vibrations as trains pass beneath. Motion detectors note visitors within the gallery and commuters walking outside. A thermostat keeps track of the temperature. All the sensors kick off events. The color of the video, and the space, changes according to how warm it is outside. When trains come through, great tentacles of Mylar inflate; one opens like an orchid to reveal a glowing light inside. Monitors within a plastic pillow radiate different tones, and the pillow moans. Nearby, soap bubbles responding to foot traffic outside percolate through clear plastic columns and shower delicately on the floor. The whole thing, says High, revs up in response to the trains, but people drain its energy, because their presence compels it to perform more functions. "Endosymbiont" is a remarkably complex interactive work. It's not a case of pushing a button, or stepping on a pedal, and getting a response. This piece breathes, gurgles , and screams based on the activity in its environment. The gadgetry, plus the cheesy materials of Mylar and plastic, could have added up to a large-scale version of a middle-school science project, but the artists pull it off because the piece is responsive in so many different ways it really seems to be alive.